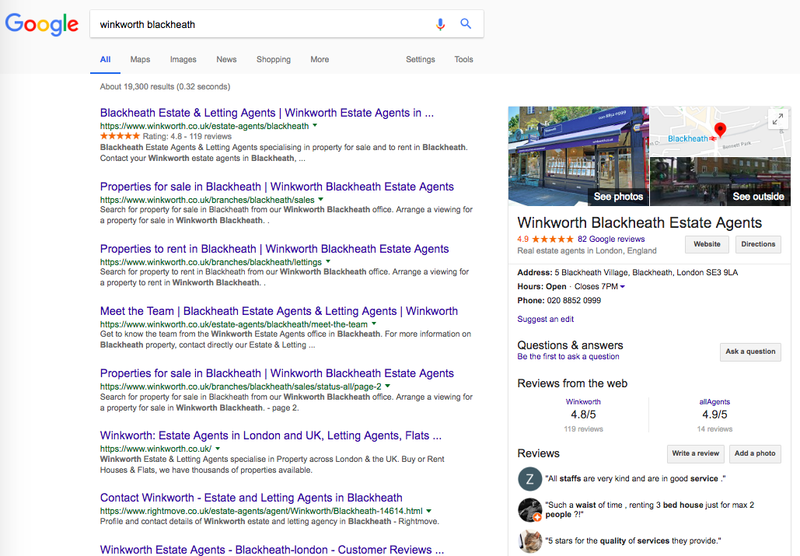 HelpHound Blog: Why are online estate agencies using reviews sites, not Google reviews? Why are online estate agencies using reviews sites, not Google reviews? ...but we are going to revisit them here for the benefit of all. The BBC, as some may know, has taken an interest in what the marketplace calls 'online' estate agents (Purplebricks featured on Watchdog recently). 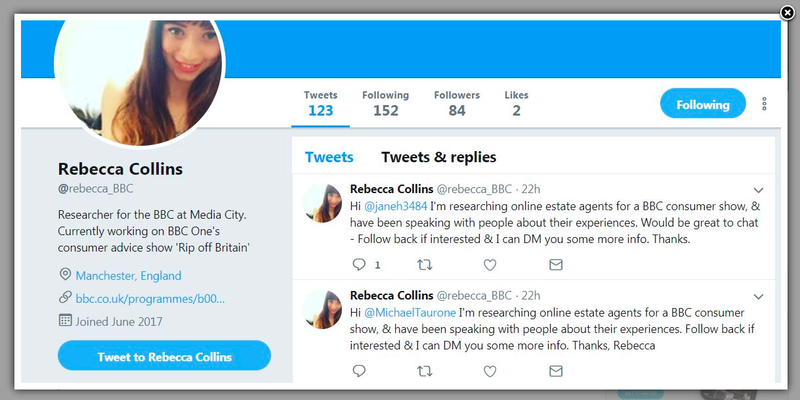 It was reported today that a BBC researcher is asking - via Twitter - for anyone with experiences of using 'online' estate agency. Should anyone doubt the angle the BBC is taking they would do well to note the title of the programme the researcher is working for: 'Rip-off Britain'. Now, all disruptors come in for criticism - not everyone liked/likes Laker Airways, or Google, or Uber, or AirBnB - some of it undeniably justified (growing pains?) but there are aspects of the marketing practices adopted by some of these businesses - the online estate agencies - that bear further scrutiny, and that's what this article is all about - from the reviews perspective, anyway. All our clients' customers are asked to post to the business's own website (that's where Google sources the stars and rating at top left, as the 'Reviews from the web', centre right) and Google - helpful, for both business and consumer? We certainly think so. Google provides a highly visible reviews platform, much more visible than any reviews site (see the screenshot above) and totally dominant in mobile search. So we are at a loss as to why any business would choose any other solution. 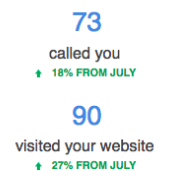 Unless, that is, the reviews sites are offering 'added value' over and above Google. But they are not; what they are offering, consciously or not, is a mechanism that has the potential to be abused by the businesses in question. 'Malicious appeals' - some reviews sites will suspend reviews pending appeal. This function was no doubt introduced by the reviews sites with the best of intentions. The flaw (and abuse) begins when you understand how some businesses use this function: by appealing just about every negative review, knowing what the reviews sites will do next (and how they differ from Google). If you appeal a Google review, the review stands until Google are satisfied that the business has grounds for appeal - only then will it be taken down (and, trust us, the appeals process is rigorous). We know of at least one reviews site that will suspend a review immediately it is appealed by the business and only reinstate that review upon proof-of-purchase by the reviewer. This behaviour is also non-compliant with the CMA regulations. More and more now we are meeting businesses that are aware of the CMA regulations - and have therefore decided to retreat from any reviews solution ("if we have to invite everyone, then we would rather invite no-one"). They understand the power of reviews to drive business, but they (quite rightly) have weighed this against the possibility that the solution they choose may be non-compliant. How does HelpHound square this circle? By focusing first on our clients' own websites - we enable them to invite reviews there (from anyone at any time - therefore compliantly). At this point all reviews are moderated and with any that are inaccurate or potentially misleading - that crucial phrase again - we invite the business and the reviewer to engage with each-other, pre-publication. Both know that the reviewer has an absolute right to have their review - whatever its content - published, but in practice the system works wonderfully well, for both parties. The company is saved the pain caused by an inaccurate or misleading review, the reviewer is almost always grateful that they have avoided being corrected in public (via either HelpHound's or Google's response mechanism), and, perhaps most important of all, consumers who read the reviews (and use the business's Google score as a guide - as so many now do) are not misled one way or the other. At this point - after the review has been published on the business's website - the reviewer receives an automated invitation from HelpHound to copy their review to Google (it could so easily be a reviews site instead, but why would it be?). The key, though, is that HelpHound is currently the only viable solution for high-value service businesses such as estate agency, wealth management, accountancy, legal and medical services - where the accuracy of reviews is paramount for everyone concerned. Independent review sites - this article is nearly two years old - how right were we then?